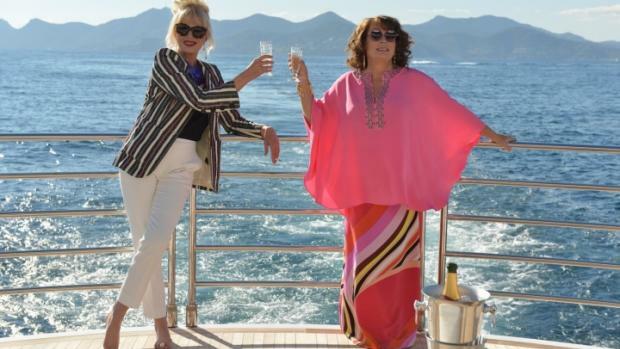 Film Review: ‘Absolutely Fabulous: The Movie’!! At long last, the quirky and off the wall TV show comes to the big screen. Personally, I never knew about Absolutely Fabulous the TV show, but the pre-awareness of this show was quite evident in the audience. I was surrounded by a cacophony of hoots and yells from the show’s loyal following which lasted the duration of the film. In 1992, BBC introduced the world to Edina Margaret Rose Monsoon (Jennifer Saunders, writer and creator) and Patsy Stone (Joanna Lumley) who have been best friends since grade school. They are well known for crazy antics and substance abuse (alcohol, drugs, and fashion). I didn’t recognize that I had seen Saunders in Spice World (faux fashionista that talked to Posh) and Lumley in Shirley Valentine (Marjorie). The movie sticks to the TV show’s theme, party til you drop dead, pretty well. Although, I think the TV show was funnier than the movie, it is a grand adventure. Yes, I had to binge watch the TV series to confirm my suspicion. I found this brand of humor ludicrous and odd, but it is clear that the film’s intent is to make fun of itself. Absolutely Fabulous the Movie features many cameos of prominent British musicians (Lulu and Emma Bunton) and actresses/actors (the infamous Joan Collins and Graham Norton), one of my favorite actress, Gwendoline Christie (Brienne of Tarth on Game of Thrones, for the few people in the world that don’t already know who she is). Also, American stars like Jon Hamm (Mad Men) and Jerry Hall (Batman) and models galore. Absolutely Fabulous the Movie is so similar to Prêt-à-Porter in regards to fashion and calamity. Last but not least, the wonderful cast of the hit TV show “Absolutely Fabulous.” Yes, Saffy, Bubble, Magda, etc. join Edina and Patsy to make the film complete. Cinematically the only issue I had was the dizzying handheld during the party scene. The jokes were a little off, over the top, for these ears. However, excess is par for the course with Edina and Patsy. Overall, I was so shocked at Absolutely Fabulous the Movie that I couldn’t take my usually detailed notes. It is an oddball film and an acquired taste. So, if goofball, satires of society or elitism are your thing, leave the kiddies at home and go see Absolutely Fabulous the Movie! You will get a serious ab workout or need for a stiff drink. This entry was posted on Friday, July 22nd, 2016 at 8:25 am	and is filed under Film, News. You can follow any responses to this entry through the RSS 2.0 feed. You can skip to the end and leave a response. Pinging is currently not allowed. « Here’s the new ‘Exorcist’ Trailer!